One of the biggest way that people can help rescues is to educate and advocate on issues that help or hurt our furry friends. As easy as this may sound, some of these issues place us in difficult or uncomfortable position when having to speak out against friends or neighbor who do not see anything wrong with the situation. The most common issues that arise, and are the main contributor to the overpopulation in shelters across the country, are: the negligence to spay/neuter pets, back yard breeders, and seeing pets as "disposable" when an change arises. Below is information on each of these topics to help understand why it is an issue and to start a conversation why to speak out and advocate or educate when you see it occur. Breeders, Backyard Breeders and Puppy Mills. It has come to our attention that many pet parents are unaware of the differences between Breeders, Backyard Breeders, and Puppy Mills. It is important to understand that the animal world is not black and white. All breeders are not puppy mills, and all people who breed are not considered responsible breeders. Our opinion will always be adopt. Don’t shop. The best choice is always save a life and adopt from rescues and shelters. However if a person is wanting a specific breed it is important to purchase from a reputable and accredited breeder. So what exactly is a "good" breeder, well that is what we hope help you understand with this information and I hope that people will use this information to make more informed decisions. According to Humane Canada, a good/reputable breeders are breeders that "put a great deal of time into caring for their animals, researching and deciding which to breed and screening potential buyers. They are very involved in their breed club, they participate in shows and other competitions and their animals are a huge part of their lives. They do all of this because they care – not to make money. Ethical breeders usually make, at most, a small profit from the sale of their puppies/kittens because most of the money their clients pay goes to cover expenses such as health screening for genetic disorders, stud fees, vet fees and registration." It is recommended that to know for sure where your pet is coming from to visit and see first-hand the conditions of the facility/home. Be sure you visit before you hand over any money. Humane Canada offers a list of questions that should be asked to determine it your pet is coming from a reputable breeder. This term is used for people who either intentionally breeds one or a few cats/dogs but have very little knowledge, or who have an accidental litter because they hadn’t got around to spaying their female yet. They may seem harmless, but there are so many of them that they make a substantial contribution to Canada's pet overpopulation crisis. The number one goal of a puppy mill is to make money. They could care less about the health of their animal. If you are ever looking for a purebred animal, please be aware of online sites that promise a pet overnight, or in a short period of time. More often than not, these puppies are coming from puppy mills, and in order to get them to stop, they need to have less demand. Not until you get bored pets. Not until you get a significant other pets. Not until they get old pets. Not until you get a new pet pets. Not until you have to move pets. Not until you have a baby pets. Not until you can no longer afford it pets. Not until you have no time pets. They are a lifetime commitment… whether that is their lifetime or yours. Animals are family. They are not some object that you own just so you can say you own one. They are not something you can brag about and show off to your friends, or strangers, only to ignore and neglect when no one else is around to see it. They are not something to be owned for your entertainment, and then discarded when they no longer amuse you or if they displease you. They are not property. They are not meant to be around until you can no longer afford to care for them, or have no more time for them. These are things that should have been thought about before making the decision to bring an animal into your home. Before impulsively adopting an animal or grabbing that "free kitten" remember they can live up to 20 years. Also note that no animal is "free" ASPCA averages that a responsible owner will incur at minimum $1000 in the first year alone. If you have a pet or know someone debating on the decision to surrender or abandon your pet please read our information section or do your own investigations to try and find a solution to the issue. Your pet is part of the family - your pet should be forever. Cats will have their first estrus cycle, or 'heat' when they reach puberty. On average, puberty or sexual maturity first occurs in cats at about 6 months of age, but this can vary slightly by time of year. Cats are "seasonally polyestrus", which means that they have multiple estrus cycles during the breeding season. The breeding season for cats will vary according to geographic and environmental factors such as temperature and the number of daylight hours. In the Northern Hemisphere, female cats usually cycle from January until the late fall. Cats that live in more tropical regions or that mainly live indoors may cycle all year round. Each heat generally lasts several days - it can be as short as 1 day or as long as 7 days. If the queen is not mated during estrus, she will "go out of heat" for a short period of time, usually 1-2 weeks. Thus, the average complete estrus cycle of a cat is 1-3 weeks. Cats are "induced ovulators", which means that the act of breeding stimulates or induces ovulation or the release of eggs from the ovaries. Therefore the queen can be bred at any time during the active stage of estrus or heat. It only takes a minute or two for cats to mate, and cats may mate multiple times in a short period of time. Queens may mate with several different tomcats during this time, so it is possible that a litter of kittens may have several different fathers. Once ovulation has occurred, the queen will go out of heat within a day or two. Pregnancy lasts approximately 9 weeks (63 days) in the cat. The best way to prevent your cat from becoming pregnant is to have her surgically sterilized or 'spay' operation. There are no valid reasons for letting a cat have an estrus cycle or have a litter of kittens before being spayed. Cats can become pregnant on their very first estrus cycle, increasing the chance that an accidental breeding may occur. Cats are indiscriminant, so a brother cat may breed with it's sister, a father may breed with his daughter, and a son may breed with his mother. There is no reason to let your cat have a litter. A large number of the "free" kittens backyard breeders give away each year only helps to contribute to the overpopulation in shelters across the country and the needless suffering of others who are left abandoned or neglected. Select a pet ​that's suited to your home and lifestyle. 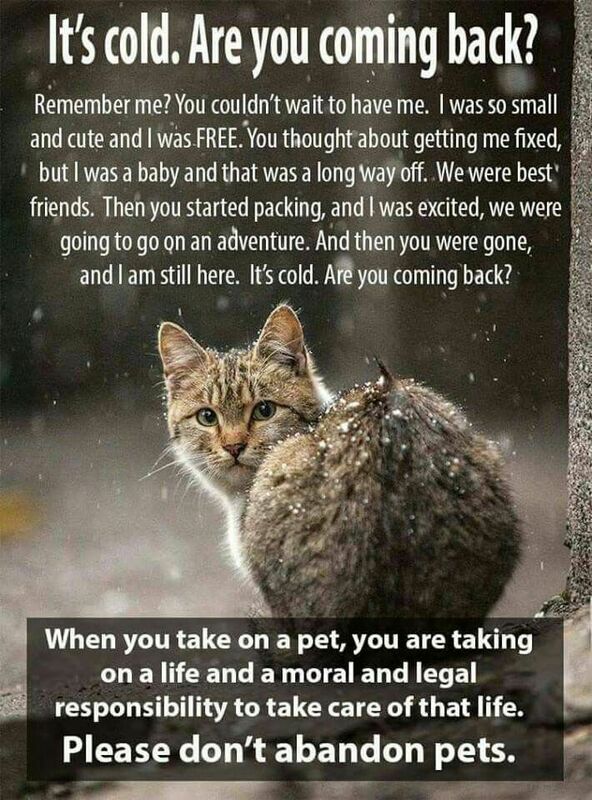 Don't allow your pet to stray or become feral. 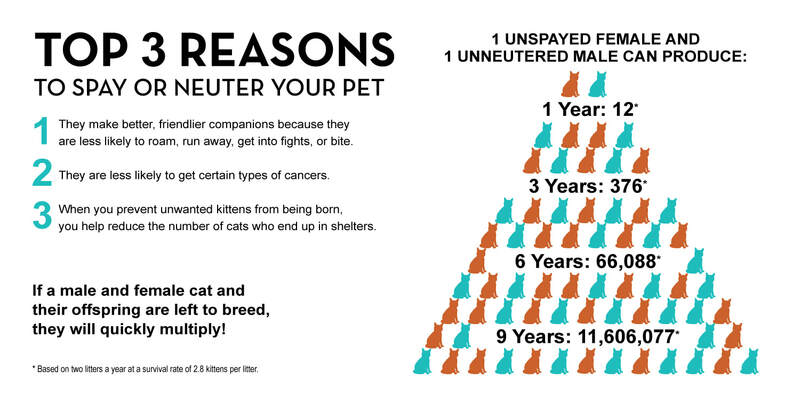 Don't contribute to our nation's pet overpopulation problem: limit your pet's reproduction through spay/neuter, containment or managed breeding. Recognize any decline in your pet's quality of life and make timely decisions in consultation with a veterinarian.